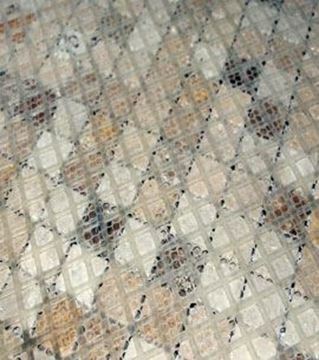 A plastic mesh of approximately 2mm which holds mosaics rigidly in position when tiling. Used by both Professional & DIY to make mosaic fixing fast and simple, and to give a fully satisfactory finish. As a leading tile supplier in the UK, supplying Derby, Nottingham, Chesterfield, Leicester, Mansfield, Tile Town is always on the lookout for innovative products that we know our customers will love. Anything that can make a tricky or difficult tiling process easier to do is something that belongs in the Tile Town catalogue, and mosaic meshes fit this perfectly. Tiling mosaics can be a complicated and fiddly process. The smaller sized tiles and larger number of them means that it is difficult to keep them all in place when trying to tile them. That’s where mosaic meshes come in. Take a look at our mosaic meshes – remember that we offer next day delivery on all of our products for the whole of the UK. Mosaics are a truly striking way to tile a room. You can cover a whole wall in mosaics, use them sparingly, or even use them to border certain features. They can be a real asset to the look of the room, when they are tiled correctly. This is easier said than done. But, luckily STS have come up with a tool that will make mosaic tiling a far less daunting task for professional contractors and DIY enthusiasts, alike. A mosaic mesh is a plastic mesh of approximately 2mm which holds mosaics rigidly in position when tiling. Used by both professional contractors and DIY enthusiasts, mosaic meshes make mosaic fixing fast and simple, and give a fully satisfactory finish. If you have ever done a mosaic job before without a mosaic mesh, then you know just how frustratingly difficult it can be without something to hold them in place rigidly. STS manufacture the mosaic meshes in our range. A family business which believes in innovation and hard work, they are passionate about all things tiling and are committed to constant innovation. STS see everyday problems and then develops new products to solve them, focusing their efforts on the work that tiling professional do. This means that their products have been designed with professionals in mind, using relevant experience, ensuring quality, durability and comfort. Take a trip to one of our East Midlands showrooms, in Derby and South Normanton and see how effective the mosaic meshes are for yourself. Feel free to chat with the Tile Town team to discuss any plans you’ve got for your home or any other jobs you’ve got coming up. The team will be glad to advise on the best tools and materials to use for any tiling jobs you’re going to be doing. Get an even better deal on mosaic meshes by downloading a 20% DISCOUNT VOUCHER for use IN-STORE.